You’ve just created a strong Ad Group structure for your Adwords campaign so the next step is to create some ads that work. Here are some tips for creating and working towards ads that attract clicks from the right type of traffic. You can’t read the label from inside the bottle – I’ve heard this saying come up numerous times when trying to get business owners to open their minds and put their business prejudices aside. The ad can have a massive impact on the profitability of your campaign and unfortunately we as business owners don’t always know what our customers respond to best. Often our sales spiel is full of scary industry speak and acronyms that someone on the outside has never heard of. If our customers don’t know how we speak, why would we put it in an ad? The best way to learn how the customer responds is to always have two ads per ad group. When first starting a campaign you want to make sure the ads are significantly different so you can test different approaches faster. Start off by having one of the ads read exactly how you think the product or service should be sold – fancy industry speak and all. The next ad should be sold so a layman can understand what you’re talking about and you’re focusing on solving their problem rather than quoting product features. You’re doing this to see if one type of ad works drastically different to another. If you’ve got a competitor that’s been using Adwords for a long while then there’s a good chance that they’re happy with their campaign. Pay attention to what they’re using in their ad copy to not only apply to your own ads but also to test doing the extreme opposite. If all the advertisers have the same headline – and they often do – then changing the headline to stand out can be a big advantage. Another thing to look at is if they’re including the price in the ad. If they are and yours is better, then great! If not, but the price difference is insignificant, then it may not be the best idea to include it unless you can get across the extra value you provide in the ad copy. Try pushing the extra value and take on the competitor directly in the ad. If you offer something that attracts the customers attention and follow it up in your sales copy then your ad will do well. (Not delivering on your ad’s promises is asking for trouble). If you price is in another ball back…well I talk about that below. By default, Google will rotate your ads unevenly and based on what it thinks is best for your campaign. Unfortunately Google doesn’t know what’s best and this uneven rotation makes it difficult to compare the performance of each ad. Changing this is quite simple. 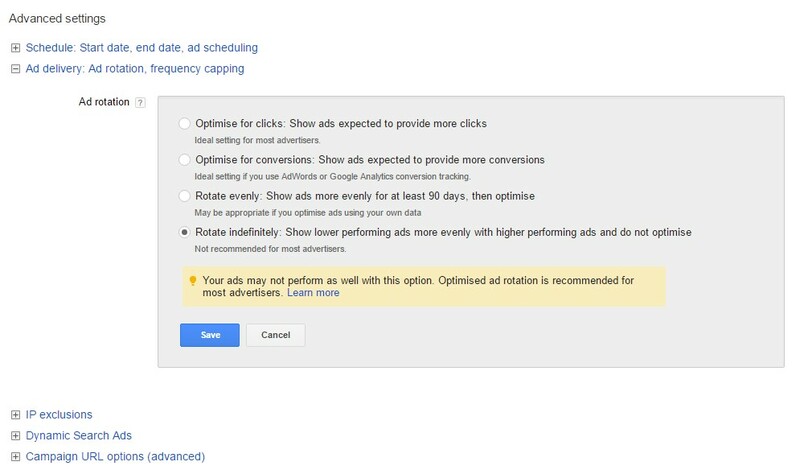 Login to the Adwords Dashboard and navigate to your Campaign > Settings. Under Advanced Settings expand the section for Ad Delivery and select Rotate indefinitely. Each ad will now get roughly the same amount of exposure as the others which will let you judge the performance accurately. This is super important when running your campaign – you only want to pay for people who are most likely to convert into a sale or lead. This means you have to both think about who you do want AND who you don’t want. If you’re a plumber and someone searches for “fix a leaking tap”, you would want your ad to be clear that you’re a plumbing contractor and not a DIY site, otherwise you’ll have people visiting your site – that you pay for – leaving disappointed because it had no instructions on how to fix it. Over time you’ll be able to review the search terms people are using when they click on your ad and you can start to find patterns of search terms you don’t really want to pay for but at the same time can’t use as a negative. Deal with these with your ad copy. Also listen to feedback when someone contacts you as a lead and you can’t deliver what they require. If patterns start to appear then once again address these in your ad copy so you don’t pay for that traffic in future. When you check the performance of the ad variations, don’t just look at the CTR; you primarily want to look at the conversion data. If the CTR is higher but the conversion rate is lower then their is a disconnect between the ad’s copy and what you’re actually offering. This can happen if you promise the world but don’t mention hurdles such as price or limitations. If price looks like an issue and you don’t think you can convince a potential but budget-conscious customer the value of your offer then test including the price in the copy of the ad with the high CTR. This will prevent some of the clicks from people who would never buy due to the price. If there are strong reasons why a portion of people won’t buy then cutting them off at the ad can work in your favour. A high CTR but low conversion rate can tell you a lot about how the customer is thinking and you can use it to improve the higher converting-lower CTR ad. Once your ads have generated enough clicks you can now evaluate their performance. A tool such as this Split Test Calculator can take some of the guess work out of picking a winner; it asks for visitors and goals (conversions) but you could simply plug in impressions and clicks if you wanted to check the statistical significance for two ads CTR. When you know which ad won, you want to pause the loser and then make a new ad to replace it. Consider what caused one ad to win over the other when making the next version and also mix up between making drastic differences and minor ones. Sometimes it’s good to try changing just a word or two to see if that small change has a drastic impact on the performance of the ad. I strongly suggest you create a spreadsheet which documents the changes and the performances each ad version had so you don’t go over what you’ve already done. It also lets you revert if things take a dive – but this shouldn’t happen if you always try and beat the winner. Be careful about adding Ad Extensions that cause you to lose control of the customer’s path. Sitelinks may get you a higher CTR but if they’re going to a page that isn’t optimised for lead generation or conversions then that customer may be lost. Keep an eye out on clicks going to the sitelink extensions and if they’re underperforming consider making changes to the content on that page to try and convert then to a lead. Ideally you want to give the customer two choices when they end up on your site – either leave or take one step closer to becoming a conversion. Try different call to actions – if you’re ad doesn’t even include a call to action then get on in there! Click here, call today, learn more, visit our website…the call to action should guide the reader to take the next step you need them to take. Try leading instead of ending with the call to action to gain the reader’s attention. Use emotive words – If your ad is rather dry then try and liven it up with some words that trigger emotion rather than state the facts. How this is done depends a lot on your market but if all your competitors ads are all the same boring copy, hitting the reader with some emotion might do the trick. Use Your Company Name in the Headline – This is a dry approach but it can work to build trust and authenticity, it can be very important if your brand has a great reputation already. Sell the solution rather than the service – This continues on from the one above: What are the pain points that your customers have? Use your ad to acknowledge this pain and then tell them that you can solve it. People often want to hear a solution and not a list of features so test this in your ad. A same-side selling approach (look up Ian Altman) works wonders with Adwords text ads. Try just listing benefits – Use points rather than long sentences to get more of the benefits into the ad copy. Finish it off with a strong call to action. Experiment with the Display URL – The display URL doesn’t have to be the same as your final URL. Use it to add more keywords and benefits in the copy or to drive home your call to action. Leaving the Display URL at just the homepage is a wasted opportunity. Provide a Unique Offer – If you can create a limited offer for Adwords users then try including that in your copy or as a call-out extension. Click to Call – If you’re happy with your phone sales process then test adding a click to call extension. This gets you the extra space like the sitelinks but the worse case is you get to speak to that person. This is the end goal for a lot of advertisers so make sure you add it to at least test. Play with punctuation and capitalisation – simple things like the use punctuation marks (within reason) or capitalising every letter can make your ad stand out and have more of an effect than you might imaging.